Get ready to experience the grand age of reptiles! 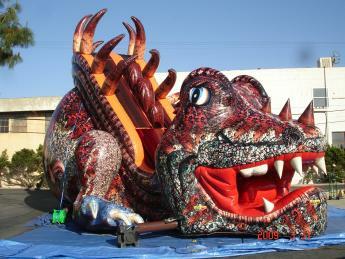 The dinosaur slide's realistic scales, claws and mouth are as impressive as his 85-foot body length! Visitors embark on their Jurassic experience through the jaws of the dino slide and climb up 17 feet to the top of sliding platform and cruise down the curving back. 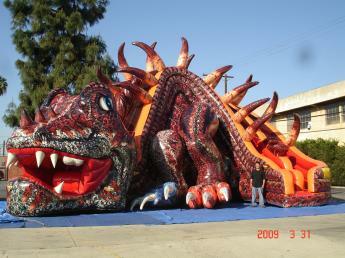 The 180-degree slide allows the journey to continue; participants can then climb back up the curving dino tail and enjoy a straight slide down through the Dragon's mouth. 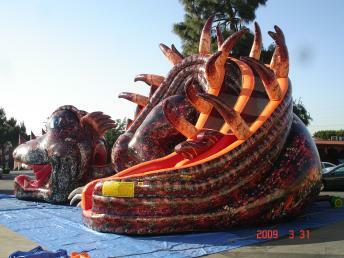 This provides a 190 feet of continuous climb and slide thrill on a single full run. Great for Festivals & Corporate Parties! FUN for all ages, adults love this slide just as much as kids do! WARNING: Requires a large amount of space to setup!